If seven straight wins and listening to Vin doesn’t make you a Dodger fan, I’m not sure what will. Outside of the cheap shots taken at Tommy Lasorda and the McCourts, the story in today’s L.A. Times by Mike Penner was an enjoyable read and does remind us how lucky we are to have had Vin Scully talking to us all these years. As for the sports section, the news coverage certainly seems to be about a team that just swept a six-game homestand for the first time in 12 years and won for the 15th time in the last 18 games, but Page 2 is the exception on this day. T.J. Simers is back, now that the Clippers and Lakers are done, which means more fun for us in the coming months. And while I’ve been called a lot of things in my life, this is definitely a first for me. Today I got dubbed Nomar’s "man-servant," which definitely got a chuckle out of me and quite a laugh out of my wife. She probably agrees with T.J. However, as Nomar’s humble servant, I must disagree with the assessment in today’s paper. The truth is, though he might not be willing to trade barbs with T.J. for the sake of selling newspapers, Nomar has quite a personality. Since May 5 when I posted a blog about him showing quite a bit of leadership in the clubhouse, the team has gone 15-3 and Nomar has the second-best average in all of baseball, batting .438 with 21 RBI. Yet it’s obvious that he doesn’t want to be the center of attention. How do I know this? Because he’s told me so. The truth is that while he actually has exactly the type of personality that plays great with the media when he wants to, he really doesn’t want to. After a recent victory in Coors Field, the beat writers all gathered around him and tried to get him to talk about everything that he’s done during this hot streak and how he is carrying the team. He spit out a bunch of cliches and tried to deflect attention to his teammates for more than 10 minutes before they finally realized he wasn’t going to take credit for what has been accomplished. A few minutes later, I was sitting on the bus back to the team hotel and he came over to talk to me. All he said was, "In case you can’t tell, I really don’t like to talk about myself." And that was it. Meanwhile, I’m guessing the kids that spent time with Nomar and Kenny Lofton at Eric Gagne’s bowling event earlier this month probably had no problem getting to see their favorite players’ personalities. And even though the event was partially benefiting T.J.’s favorite charity, the Mattel Children’s Hospital, he was nowhere to be found when a dozen of our players were out in the community. Yesterday, we made it even easier. 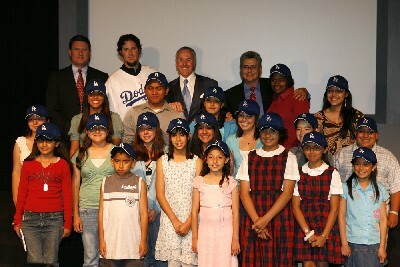 Eric Gagne and Frank McCourt went to the L.A. Times building to spend time with the winners of the Times In Education 2006 Team Think Blue Program, which promotes literacy and creative thinking. They spent two hours at a luncheon hosted by the L.A. Times, chatting with the kids who had won the essay and art contests. But no one saw T.J. there either and there was no mention of it in today’s story. Here’s my solution. With a readership of hundreds of thousands of people, T.J. has a chance to really make a difference with what he writes. So from now through the end of the season, for every Dodger community event that T.J. comes to cover for his paper, I’m going to personally donate $50 to the Mattel Children’s Hospital. There’s plenty of them left, so this could cost me quite a bit, but it’s worth it. My wife has even signed off on it, but she wants to make sure that it’s T.J. who comes to cover the event, not his radio co-host/daughter. In fact, I’ll make it easy by giving a list of dates for some of the upcoming events. These are just some of the events, but more information can be found in the community section of the Dodgers’ web site. I’ll make sure he knows about every event and keep you all posted on how many he comes out to write about. If any of you would like to make donations to Mattel Children’s Hospital or the Dodgers Dream Foundation (or any charity, for that matter), feel free to join in the fun. In the meantime, enjoy a small break from baseball today. We’ll be right back at it again tomorrow. Way to go Josh. Most likely this will fall on deaf ears. After the late and great Jim Murray the Times (and other papers) has gone from great sports writers who invoke thought to writers who like to provoke fans. This has had an adverse effect on sports fans (although it most likely has brought more interest to sports) to be more negative. Just look at sports talk radio today. There are even host that comment to their listeners lack of original thought by calling them clones. This personality is simular to the kid in school who liked to provoke fights but never stood up themselves. Good work, Josh. I got your back. I can imagine that the harsher press the Dodgers get is frustrating to the front office. Your approach of actually giving Simers an oppurtunity to seriously do something positive is commendable, though. I don’t think the cheap shots will let up so very easily, though. Sportswriters are concerned with a winning team, and the Dodgers of the 90s never won a playoff game, the first decade since the depression that the Dodgers did not win a National League pennant. Some of the moves by Paul Depodesta frankly looked like more of the same old story, like losing Beltre and signing Jose Valentin to play third base. I think it will take time, but that the McCourt era will be treated more kindly after a winning season this year, a good offseason, and a winning one next year. Of course, should the Dodgers win a championship, even TJ Simers would have a hard time complaining (unless he’s a Giants fan). That’s a great thing you’re doing and I hope T.J. will at the very least humor you and turn up to these events. Even if he just uses it as an opportunity to make man-servant jokes. At least then we’ll know he’s a decent guy who just happens to like making stupid jokes. Awesome job, Josh. I hope he shows up and allows the “man servant” to help out his cause. Good posting Josh !! Makes me think about the movie “61” and Maris with the NY press !! I too have a problem with L.A. Times columnists like TJ and “Pain-***-ki” They write for the sensationalism of it and hope for the negative response. I for one just ignor it. A true fan will figure things out by themselves, they won’t have to rely on a newspaper interpretation. Columnist are just single individuals with an agenda. But, I do hope that TJ will man up and do the right thing with your challenge. Awesome Josh. TJ can be a real jerk and most of us know that. Just please let Mr. McCourt know that TJ does NOT speak for the majority of Dodger fans. I get sick and tired of all the bad press Nomar gets from time to time and I thought TJ Simers went to far. Double thumbs up to you Josh and your comments! Let’s hope he accepts your challenge. wow, i didnt think the article could actually have been as bad as everybody was saying, but then i read it. out of all the people in LA, is this really the best guy they have to write for the Times. i mean, this article shouldn’t have even been in the paper let alone the sports section. the article has nothing to do with sports at all. it must be a joke that this guy could call himself a journalist. i am sorry that you have to put up with him. i grew up in the small town of lakeland, florida and i have to say that i never read an article in the lakeland ledger that was that bad. they had opinion pieces in the sports section, but they offered opinions about sports and things that were going on. the Times should fire him. there are a million people who are better journalists than him. PEOPLE SHOULD BOYCOTT THE TIMES UNTIL THEY FIRE HIM!!! Maybe the Times was stuck in a position of either TJ Simers or Jim Gray. Let’s not be too critical of T.J. I criticized his reporting, but let’s face it, he’s good at what he does. If only he did something worthwhile. But if you don’t like his childish humor being in the sports section, then blame the LA Times for their low standards or their bad judgement. Let them know what Dodger fans want to read. Angel fans and 14-year-olds (the immature ones) can go to http://www.tjsimers.com but the Times shouldn’t insult the fans or the residents of Los Angeles. Josh, though already employed, has already proven himself more worthy with intelligent writing and more social responsibility. Incredible. And he wonders why he’s getting the cold shoulder. Send an email to the Reader’s Rep page asking him to be replaced as a Dodgers’ reporter. There’s no room in the clubhouse for this jerk. I’m sure this will get a mention later, but J.A. Adande has a good article in the Times today on Andre Ethier. There are two types of sports writers: Those who focus only on the positive and those who will tell all. We all know where Simers falls among those two buckets. But Simers is a columnist, not an investigative reporter or a beat writer, so he gets lots of leeway in what he says, much of which is simply opinion. To clear up any misconceptions from previous commenters, Simers is not assigned to the Dodgers beat by the Times. I don’t know how many of his topics he chooses himself and how many are assigned by his editors. Can Simers be an ***? Certainly. But his attitude is usually reserved for athletes who are surly to the fans or the press and who generally don’t seem to appreciate how lucky they are to have such exciting and lucrative careers. In his own pain-in-the-*** way, I think Simers speaks for the fans who spend hard-earned money to watch these players and don’t feel like they’re getting their money’s worth. A losing team is one thing, but a losing team with a lousy, surly attitude is another and Simers pinpoints that line to within a millimeter. Does anyone remember Simers’ column from last summer where Jeff Kent finally opened up and explained why he kept giving Simers the cold shoulder? Kent explained that before games he wanted to keep his mental concentration up and just didn’t like distraction from reporters or anyone, and the same often held true after games. Simers while not quite apologizing for ever having gone too far is his previous converage of Kent, promised to try to be a little more considerate. It basically ended with both guys agreeing to leave their relationship as it is, with both sides getting a better understanding of the other. Thanks for the journalism lesson. The bottom line is this — if Simers can eat dinner with you and you kiss his _ _ _ (see Clippers), you’ll get nice treatment. He’s a fraud. i hope the whole clubhouse boycotts T.J. That way he’ll have nothing to write about… tell him to cover the Angels.